Like many Career & Technical Education programs, students in the Cosmetology program offered at Jefferson-Lewis BOCES learn more than skills related to their specific field. They also learn skills related to business and marketing. According to the American Association of Cosmetology Schools, more than one third of those in the Cosmetology industry are self-employed. That means learning how to be an entrepreneur is a vital part of being successful within the industry. 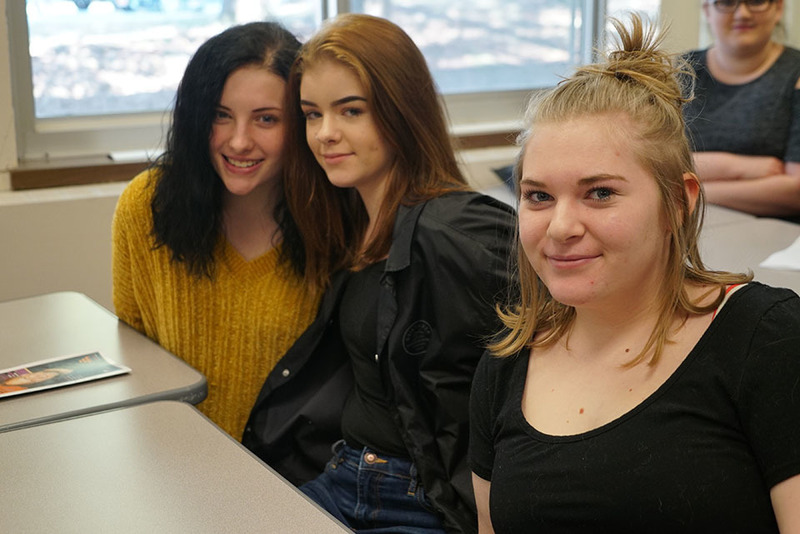 Juniors in Cathleen Freeman’s Cosmetology program at the Bohlen Technical Center recently had the opportunity to attend the Jefferson Leadership and Business Symposium at Jefferson Community College on March 20. The day was centered on teaching attendees, many of whom were high school and college students, the important skills necessary to be successful in business. Cosmetology was invited due to its partnership with JCC through the EDGE Program, which allows students to earn college credits while in high school. The keynote address was delivered by Jerry Greenfield, the co-founder of Ben & Jerry’s Homemade, Inc. He gave attendees an overview on how he and his partner, Ben Cohen, built their ice cream business from the ground up and the challenges they faced along the way. Those who attended the symposium were also given the opportunity to sample some Ben & Jerry’s ice cream. Elyse Marriam, a Cosmetology student from General Brown, liked the informal nature of Greenfield’s address. The students attended several breakout sessions during the course of the day. These sessions included presentations on using social media to market yourself, what employers are looking for in their employees, and being a leader in small business. “Attending this symposium helped me learn how to work with other people and the importance of social media in marketing yourself in a professional manner. You need to make sure your emails are professional,” says Elyse. She adds that she and fellow students left the symposium with the insight that the needs of the customer come first. During a recent class, students shared what they learned at the business symposium.